How much money does Weather Reach save? Climate controlled irrigation saves money by reducing water use, saving you time and keeping landscapes healthy. But how much money? I don't know; there are too many variables. How effective is your current water management style? What will the weather be like? If last year was cool and rainy and this year is hot and dry plants need more supplemental water from irrigation. Water use will go up just because of the weather. Several years ago we looked like heroes to a home owner in New England. Rain or shine he watered his lawn nearly every day; his water bills were huge. Then Weather Reach was installed at his home. It was a wet year. Weather Reach only watered his lawn 12 days; true story, 12 days for the entire year. Because Weather Reach uses both rain and evaporation measurements it was able to pick the right 12 days to water. Weather Reach saved 78% on his water bill. But he kept calling, "this thing is not working; it never waters” We’d ask "How does the lawn look?" he'd say "Great, its' been raining." It worked perfectly; he is now a believer. Now this is extreme, but it makes the point, that prior water management practices and weather conditions affect how much water and money you’ll save with smart irrigation control. One more story. As water conservation professional, Eric wrote the "Home Owner's Guide to Watering Your Lawn." Since he wrote the book, he decided he should follow it to see if it really worked. So every Saturday morning he went to his garage and reprogrammed his sprinkler controller. When I introduced him to Weather Reach he wanted to try it. He said, "if this automatically does what I have been doing every Saturday, then I will consider it successful.” His water use went down 22% that year. He was very pleased. Even with good management practices Weather Reach can save money. But it has an advantage; Weather Reach gets hourly climate measurements and uses advanced water management algorithms to do its job. It is much more accurate than a pamphlet based on historical information. I am often asked, "how much water will I save?” The answer I usually give is 30%. This is a conservative average based on years of working with people, helping them save money. I also like to exceed people's expectations. So don't get sucked into the marketing hype "save up to 70% on your water bill!" Look closely at the product, the technology behind it and remember, cheaper is not better. 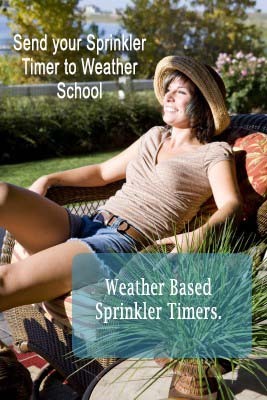 Trust your landscape to Weather Reach smart irrigation control.